You get more than just the mic in this bundle. PRESS RELEASE: To celebrate fifteen years of the RØDE NT1 and NT1-A, RØDE Microphones has announced a revised NT1-A including a premium shock mount, pop filter, cable, microphone dust cover and a bonus instructional DVD. Originally released in 1995, the RØDE NT1 can be found in professional and project studios the world over. Its combination of clarity, warmth, extended dynamic range and high SPL capability made it an instant classic with professional engineers and home recording artists alike. Following heavy investment in precision manufacturing, RØDE was able to revise the capsule and electronic design of the NT1, resulting in only 5dB SPL of self noise. Released in 2003 as the NT1-A, it has since become one of the world's biggest selling and most recognisable condenser microphones. 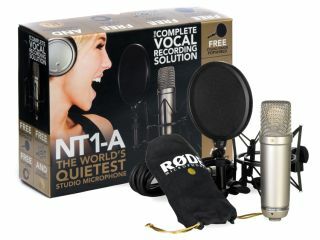 Now RØDE has truly made the NT1-A the complete recording solution by including a premium shockmount with integrated pop filter, high quality 6m (20') XLR cable, microphone dust cover and even a bonus instructional DVD. Presented by RØDE founder and company president, Peter Freedman, The NT1-A 'Studio Secrets' DVD features a range of tips and techniques to help NT1-A owners get the most from their new microphone. "We have been delighted at the positive impact the NT1 and NT1-A has had on musicians and artists around the world this past fifteen years." exclaimed Peter Freedman. "It is our pleasure to continue this, and celebrate this amazing microphone by offering a total solution to any artist". The RØDE NT1-A Recording Pack is due in the UK during October and has an RRP of £189 including VAT.